As many who know me will be aware, I’m an adopted son of Kent, having moved here when I bought my first house in 1987. Surrey are the county I consider myself to be a supporter of, even if I only get to two or three games a season, and the team whose scores I check first, but I’ve always considered Kent to be my ‘second county’ not least because I went to a school where many of my classmates came in from areas in the London Borough of Bromley, and thus numbered themselves among the fans of Kent. I also recall that one of my favourite players, Alistair Brown, whose birthday I happen to share, was a Beckenham boy although it doesn’t seem that he was on the Kent books at any stage; of course that is far closer to the Oval than to Canterbury. So I have always followed Kent from a short distance, not least in the 1970s when they included a number of England players past and present – Knott, Woolmer and Underwood from the 1977 Ashes-winning side, Tavare, Downton and Dilley attracting the interest of the selectors, and former players Denness and Clinton doing well at Essex and Surrey. To be a Kent supporter in the seventies was to know regular success, but it hadn’t always been the case. In the postwar period the county performed poorly. In the Championship they finished 15th in 1948, 16th in 1953 and 1956, and 14th in 1957. Between 1951 and 1963 the county managed just one placing in the first ten, when they took 8th place in 1958. And of course for most of that time their supporters looked on enviously at the unprecedented success – seven consecutive titles – of their neighbours at Surrey, and older members, with memories of Woolley, Ames and Chapman, viewed proceedings in undisguised dismay. The simple fact was that the county had only two players of undoubted Test quality, wicket-keeper Godfrey Evans and batsman Colin Cowdrey, a precocious talent from Tonbridge School who had first played for the club in 1950 at 17 and took over the captaincy from Doug Wright in 1957. In the mid-sixties things began to turn around. Seventh place in 1964 was seen as a definite improvement – and young players were starting to make a real mark. A young Scottish batsman, Mike Denness, passed 1000 runs for the first time, while the 19-year-old Derek Underwood took 101 wickets in all first-class matches (he finished well down the national averages though; to modern eyes an average of 24 seems respectable enough but Tom Cartwright’s 134 cost him less than 16). The county’s results improved year on year until in 1967 and 1968 they finished runners-up each time. Additionally they tasted one-day success for the first time, beating Somerset in the 1967 Gillette Cup final. So what was going wrong in 1970? At the end of June, after seven matches, Kent were bottom of the table. Cowdrey was back to full fitness after an Achilles tendon operation the previous year, but his first 13 innings yielded only 152 runs. There had been individual highlights – Underwood took 14 wickets against Warwickshire at Gravesend, and Cowdrey returned to form with 65 and 106 against Essex at Tunbridge Wells – but they had not translated into results; both of those matches were lost. The turnaround came with the arrival of July. With Cowdrey playing for England against the Rest of the World at Trent Bridge – the only match in the series won by the hosts – Denness led the side at Harlow in Essex (like Gravesend, another long-gone venue) and hit 167 not out as the visitors won by an innings and 24 runs. The win was all the more creditable because Knott and Underwood were also on England duty – the bowling stars were West Indies all-rounder John Shepherd and opening bowlers Norman Graham and John Dye. It’s perhaps not widely unknown outside England that the late Mike Denness was an opening batsman for much of his career, after all he never needed to do it for England (aside from his 1969 debut against New Zealand) with openers of the calibre of John Edrich, Geoff Boycott and Dennis Amiss available. But at this stage he was the regular opening partner for Brian Luckhurst, another who played against the World XI and for whom full England honours were just around the corner. Denness generally batted in the middle order once he took over as captain of Kent in 1972, but returned to the top after moving to Essex late in his career. The next match, at Lord’s, was lost – largely due to an outstanding display by fast bowler John Price, with 14 wickets, and was followed by defeat in the Gillette Cup by Sussex, the eventual finallists, when they were unable to chase 200 – on that occasion Tony Greig took five wickets and Don Bates’ 12 overs cost only 18 runs. Team manager Les Ames held a meeting before the next match at Maidstone in which, if he didn’t exactly read the riot act, left the players in no doubt of what was expected of them. In particular they were told to pay attention to bonus points, a relatively new system, and one which has been much tinkered with in the years since. Kent drew that match at Mote Park but took eight points to Derbyshire’s four and remained unbeaten for the rest of the season. There were some close shaves – they beat Gloucestershire at Cheltenham by one wicket and Surrey at Blackheath in a thrilling finish by 12 runs with seven balls remaining. Asif Iqbal hit a hundred in that game, one of three he made that season on his way to 1,379 runs, while off-spinner Graham Johnson, one who was perhaps unlucky never to play for England, took 12 wickets. There followed another exciting finish at Folkestone against Nottinghamshire, where the home side made 283 to win in 52 overs after a typically sporting declaration by Gary Sobers. The title was in doubt going into the last round, although Kent were ahead by this stage – but their main challengers Glamorgan, the previous year’s winners, had the worst of a draw against Lancashire, and the margin for the champions was a convincing 17 points. Dudley Moore recorded the hour of victory in his history of the club: “on the final day at the Oval the Prime Minister, Edward Heath, joined the players in a celebratory glass of champagne, no doubt revelling in the triumph of the club he had supported since as a schoolboy he used to cycle from his Broadstairs home to watch Kent at Canterbury. 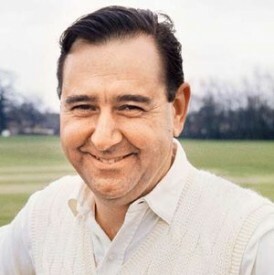 It was on that day too that Cowdrey, asked about his future, replied spontaneously that he would retire from the Kent captaincy at the end of the 1971 season.” For the icing on the cake the second XI also won their championship, future West Indies quick Bernard Julien finishing with most runs and wickets. The title of 1970 ushered in a golden era for the county, which didn’t end with Cowdrey’s retirement in 1975. Three years after that Kent won the double, taking the Benson & Hedges Cup as well as another Championship. Since then, success has been rather harder to come by, and such England players that the county has produced have had rather fleeting careers (think Dean Headley, Rob Key, Martin McCague – only Geraint Jones in the last 20 years has had an extended run in the Test side). Kent have been in Division Two for most of the fifteen or so seasons since the two-tier setup came in. But Canterbury and Tunbridge Wells are great settings in which to watch county cricket – the beer is far superior to the Oval’s as well – so I think I’ll be dividing my loyalties for a while yet.